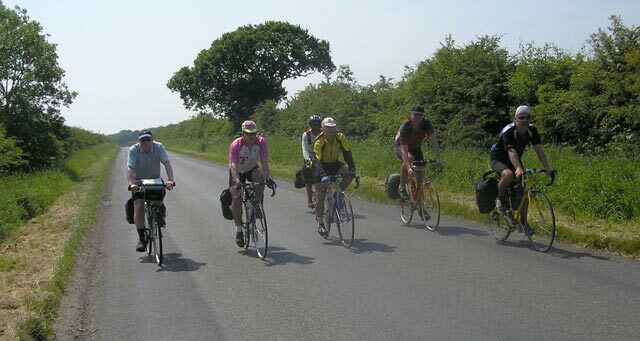 Once again, in 2006, I and a group of my colleagues undertook a 3-day bike ride. As in previous years, Paul (Veggie) planned the ride and organised the accommodation. The chosen route for this year's ride was from London to York, which Veggie claimed would be a similar distance to the rides in previous years (or maybe just a little longer). The date was set for the second weekend in June, and most of us went on a number of 30 to 40 mile training runs after work in the weeks leading up to the big ride. 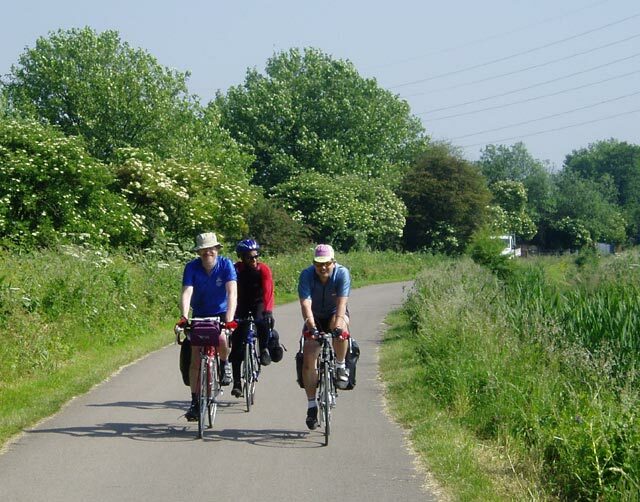 The route was loosely based on National Cycle Network Routes 11 and 1, which would take us back home to York via Cambridge, Lincoln and the Humber Bridge. It was an early start, with the riders travelling on the 6.30 or 7.00 trains from York to King's Cross. There were seven of us on this year's trip: Veggie, Paul, Jim, Brent, Greystone, Andy and me. 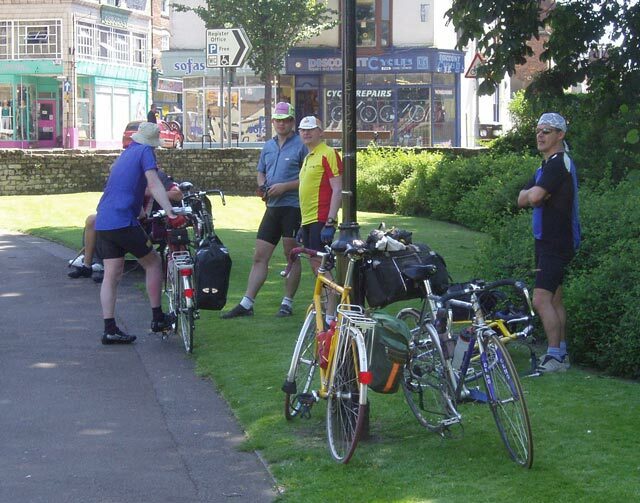 All had taken part in the 2005 Coast and Castles ride. The weather forecast for the next three days was hot and sunny, with temperatures expected to reach 29 degrees. Both trains arrived in London on time, and we set off somewhat nervously into the rush-hour traffic on Pentonville Road. The traffic was hardly moving, and we soon realised that the only way to make progress was to follow the example of the local cyclists, by weaving amongst the slow-moving vehicles. After less than a mile, just beyond the Angel, we turned off into a quiet side street which led us to the Regent's Canal. This was quite an eye-opener for us, as there was a lot of traffic here as well, but it was all bikes! It was like a motorway for cyclists, and progress was reasonably fast, although there were some narrow bits and tight corners when going under bridges, and I wondered how often bikes and their riders ended up in the canal. 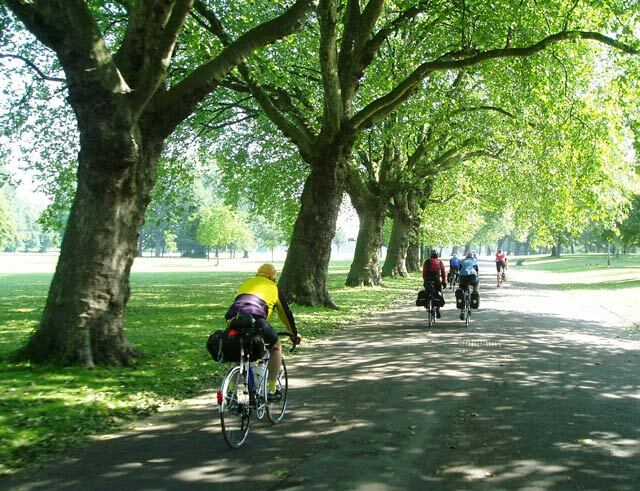 There was a short section through Victoria Park, then out onto the Hertford Union Canal towpath and past Hackney Marshes. We left this canal and passed under the railway at Coppermill Junction, via an underpass with only 5 ft headroom. Amazingly Jim managed to get through without getting stuck. More canalside riding followed, along the River Lee Navigation, and it all seemed a million miles away from the London traffic. It was very peaceful, and we spotted herons and cormorants along the way. We left the canal near Brimsdown and crossed over the M25 (where the traffic was not moving as fast as us) to reach Waltham Abbey. This was a suitable spot for a mid-morning coffee break, so we found a cafÃ© in Sun Street. Some of the hungrier members of the group also had a late breakfast here. On the B194, about a quarter of an hour after leaving Waltham Abbey, Veggie and Greystone both got flat tyres after hitting a pothole in the road. Inner tubes were quickly replaced, and we wondered whether we could arrange for future punctures to happen in pairs, to save time. We continued through Lower Nazeing, then up a hill (the only hill on the whole route steep enough for an arrow on the map) to Roydon, and on to Harlow. We were on some busy main roads through Harlow, but returned to quiet country lanes through Lower Sheering and Sawbridgeworth. We thought of calling in on the Beckhams, but realised that they would be out, it being the opening day of the World Cup. After Little Hallingbury, the A1060 brought us into Bishops Stortford, where we found a cafÃ© where we could sit outside and have lunch. There was no hurry to finish as we were now two-thirds of the way to Cambridge. Beyond Bishops Stortford there was some excellent cycling along minor roads through pretty villages, such as Manuden, Clavering and Arkesden, with its thatched cottages. Our route continued through Ickleton, Duxford, Whittlesford and Great Shelford and by late afternoon we were hitting the outskirts of Cambridge. There was a SPAD incident at a confusing set of traffic lights (Signal Passed at Danger - a railway term) but we all arrived safely at our accommodation for the night. Brent and Paul were in a B&B, the rest of us were in the Youth Hostel. After showering and changing, we met up and walked into town. Most of us ate at Lloyd's, but Veggie made his own arrangements and joined up with us later. We moved on to a real pub, the "Cambridge Blue". This is an absolute gem, in a terraced street, with dozens of bikes piled up against the wall outside, no smoking, no mobiles, and a good selection of real ales. It was very busy, and it took a while to get served, but once we had our drinks we were able to sit and enjoy them in the garden at the back, in the warm evening sunshine. We then moved on to the "Live and Let Live", another excellent back-street pub, whose offerings included beer from the Cantillon brewery in Brussels. The youth hostel did a good cooked breakfast, and we were ready to leave by 8.30. Veggie gave us a pre-ride briefing, saying that we could have an early lunch in Wisbech or a late lunch in Boston, depending on our rate of progress and how we felt. Veggie and Jim then went into town ahead of the rest of us, while we waited for Brent and Paul who were having a more leisurely breakfast at their B&B. There had been some discussion over the length of this section of the ride. Veggie, who planned the route, had said that it was "maybe a little bit longer than the other two days, perhaps 80 miles". Nobody had actually bothered to measure it on the map, but my guess was that it would be about 95 miles. We met up with Veggie and Ian in town, where we found Veggie changing an inner tube. He had been to a bike shop to buy a new tube, and get his tyre (the one that went flat yesterday) pumped up to full pressure, only he found it went flat again (damaged valve?). Anyway, he got himself sorted, and we all left Cambridge together, heading up the Histon Road. We passed through Impingham, Cottenham, Wilburton and Witchford, and after a couple of hours' cycling, arrived in Ely. We had a short pause here, by the cathedral. We continued through Little Downham and Pymore, then there was a section alongside the 'Hundred Foot Drain' where we were riding against the wind. Fortunately, this didn't last long and we had the wind behind us again as we rode through Welney, Lakes End, Three Holes, Upwell and Friday Bridge. We were all ready for lunch when we arrived in Wisbech, and we looked for a cafÃ© where we could sit while keeping an eye on our bikes, but without success. Instead, we bought sandwiches from a shop and ate them in a small park in the town. According to Veggie, it was another 18 to 20 miles to Boston. After 16 miles we had just reached Holbeach, which was less than half way to Boston. "Ah, there's a gap between my copies of maps, and it's maybe a bit wider than I thought", Veggie tried to explain, as we resigned ourselves to the fact that our distance for the day was going to be well over 100 miles. This would be a first for me, and one of two of the others in our group. We had a short break in Holbeach anyway, in order to replenish water supplies and/or have an ice cream. The route onwards to Boston took us through Holbeach St Marks, Fosdyke, Frampton and Wyberton. We hit the town just as the crowds were spilling out of the pubs after England's first World Cup game - anyone would have thought we had just won the final, judging by the noise. We found a cafÃ© where we could drink our tea outside and remain with our bikes. Some wry comments were directed towards Veggie - "We've done 80 miles, so this must be Lincoln"; "Is it time for lunch?". It was now 4.30, and Veggie called the B&Bs in Lincoln to let them know we would be late arriving. There was a problem at one, where the landlady was going out for a time during the evening, so there wouldn't be anyone there to let us in if we arrived too late. We set off again, along more quiet country lanes which made for excellent cycling. Near Tattershall Bridge, Brent and Greystone offered to go on in front, without stopping, in an attempt to get to Lincoln in time. The rest of us carried on at our own pace, which was still quite fast with the favourable wind, despite our tiring legs. We stopped for a brief rest at Woodhall Spa, then Veggie suggested a short cut, which would save us about half a mile by following the track of an old railway. Now, while many old railways have been converted into excellent cycle tracks, this one hadn't, and it was rough. The signalbox at the old Stixwould station was impressive though: a telescope was visible inside, as though it had been converted to an observatory by its new owners. A few yards further on, Veggie got a puncture, so there was a delay while he changed his inner tube. A minute after setting off again, Paul got a puncture, so our synchronised puncture strategy wasn't quite working today. Once it was repaired, we came off the old railway at Southrey then stuck to the roads for the final run into Lincoln, via Bardney and Fiskerton. There was a slight hill outside Lincoln, which wouldn't normally have been much, but after cycling all day it felt like a mountain. We arrived outside the first B&B, where Veggie, the other Paul and Jim were staying. Veggie didn't know where the other guest house was, as he had given the details to Brent. I called Brent and he gave directions for Andy and me, saying "you can't miss it, you'll see us standing outside". Greystone and Brent's mad dash had been in vain, and to add injury to insult, Brent had come off his bike and fallen into the roadside verge at one point, badly grazing his arm. After about a quarter of an hour, the landlady of the guest house returned and let us in. After showering and changing, we walked into town and had meal at a Brazilian restaurant (I had a spicy fish stew - very tasty), then on to the Tap & Spile for a beer. We were on the road again by 9 o'clock, feeling a little saddle-sore after yesterday's long day, and the hill out of Lincoln was a bit of a strain on aching legs. Once the initial climb was over though, it was level going through Scothern, Snelland and Market Rasen. In Walesby, we stopped for a break at a tea shop, after which we faced a climb up onto the ridge of the Lincolnshire Wolds. There was some level cycling along the B1225, then a long, fast descent from Caistor down towards the Humber estuary. We arrived in Barton-on-Humber at 12.30, and cycled around looking for somewhere for lunch. Everywhere was shut, except for a pub, which didn't have anywhere to leave our bikes, so we ended up buying food in Somerfield's supermarket and eating it outside. The sun was beating down strongly, and it was getting quite hot as we ate our lunch. On the road again, it was looking as though we would be back in York before 5. 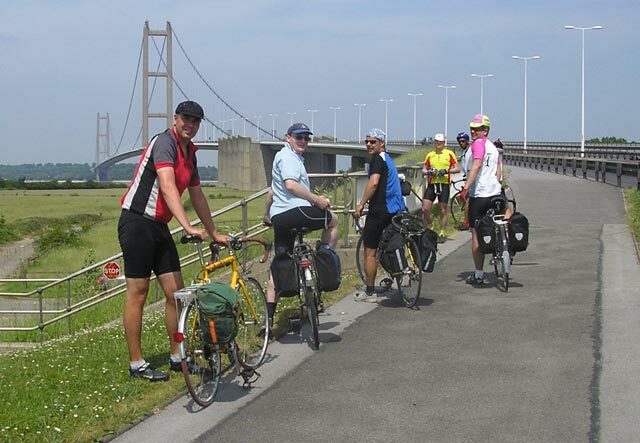 Crossing the Humber Bridge was one of the highlights of the ride. It was surprising how many pedestrians there were walking across the bridge, out for a Sunday afternoon stroll. Once we were on the north side of the Humber, it felt as though we were on the home stretch. As on the previous two days, we had the benefit of a following wind, and we made quite fast progress, through North Ferriby, Welton, Ellerker, North Cave and North Cliffe. There were many other cyclists out for a ride, including one chap on a penny-farthing. We stopped for refreshments at a roadside cafÃ© on the A163 near Holme-on-Spalding-Moor. The final section took us through Elveringham, Melbourne, Sutton-upon-Derwent and Elvington, where Veggie got another puncture, his fourth flat tyre of the trip. "Don't get another one! ", he was warned as he change the tube. Five miles further on, there was a clang as Veggie hit a metallic object on the road, as we were entering York on the Hull Road. Yet another flat tyre for him, but at least he was now getting very quick at changing inner tubes. To celebrate the completion of another successful ride, most of us headed for the Maltings to quench our thirsts and settle our debts with Veggie for the accommodation. I felt quite elated at our achievement - if I had known it was going to be over 270 miles I might not have been so keen to take part, but in fact I felt fine at the end, apart from a rather sore backside. More in 2007!